How on earth did we get this deep into summer already? Visiting with a friend this weekend, she mentioned having just pulled her garlic. How can that be, I thought, we live so close to one another and mine can't be ready yet, can it? Of course it was. I pulled all of that this weekend, and harvested what surely must be the last of the raspberries too, making one more round of jam (this one is a must-make each year). We're in a beautiful little pocket of time where the raspberries, blueberries and blackberries have a few days of all being ripe together. It's delightful, really, to find ourselves in that corner of our farm, able to go from one berry to the other. The raspberries are on their way out though, so really it's just a quick minute that they're all together like this. Just like summer really - so incredibly fleeting, but so ridiculously abundant in that little moment. What a gift it is! Happy weekend, from our kitchen (where kid and kitten meet, against all rules, because sometimes cuteness wins)! Follow us on Instagram, Facebook and our Blog. Theresa: My name is Teresa Remple, founder of Texture Clothing, and I absolutely love what SouleMama is about! With so many shared values, it seemed only natural that we partner together in our mission to spread eco-conscious positivity. I began Texture Clothing in 2000 with one roll of hemp fabric and am now able to hire people in Bellingham & Seattle to work together to craft "Clothing With a Conscience" for women of all shapes. With a goal of “towards zero waste” and creating long lasting clothing for curvy women, we strive to make feel-good fashion which allows the wearer to more effortlessly shine their light throughout their community. Made from a blend of hemp and organic cotton, the Comfy Skirt is a perfect transition skirt, watch it conquer the bike ride home and move straight to commandeering the dance floor. The hidden front pocket fits a passport/ID/phone and its 4-way stretch allows for cozy comfortable plane and train travel. Great for before, during, and after pregnancy as well! I could live in colorful, comfy skirts like these. Appreciate the pocket. In addition, Texture Clothing would liked to offer all readers 20% of your order from now until July 31, 2017. Enter code comfyskirt at checkout. I've been working so hard on this silly wrist of mine - chiropractic care, acupuncture, wearing my brace, doing all the ergonomic good things, and most of all - trying to be sure that I don't do any one activity for too long. Though nothing is making the pain entirely go away, short periods of one activity and changing it up often seems to be the most help of all (though certainly doesn't make for easy editing and writing work. Oh!). It does mean, though, that I've been doing a bit of knitting - just a row or two here and there. The stranded color knitting, as I said before, really is the most pleasurable way to knit if I'm only going to do a row or two at a time. And hats, of course, the most satisfying in that I actually am able to finish something in those little bits of time. These two hats have been on my needles in recent weeks, they are the Happiest Hat by Mary Jane Mucklestone with a yarn selection from Tammy at Wing and A Prayer Farm. The first one (on the left), I made following the colors the pattern suggested. I love it. I've claimed it as my own, especially because it matches my new colorful glasses, and that seems as good a reason as any to say it's mine. And then I did another with my own color choosing, slightly smaller for a smaller head. That head has been chosen, as the one most excited about this hat was Harper. Pop could use a new hat this fall too, so I'll cast on for him next. And row by row, just like that, I'll finish his too. One row at a time - gosh that mantra just always seems to be what I need to hear. Thank goodness for knitting. Root & Star magazine brings quality art and literature to children six times per year. We bridge the gap between quality children’s books and the ephemeral magazine form, showcasing contemporary artists, fresh poems, funny comics, and nature-based activities. We hope that when you reach the end of the magazine, you feel more peaceful, joyful, and connected to your ROOTS and to your STARS. The idea for Root & Star magazine occurred over two years ago, when my young daughter raced into my studio with mail she was delighted to see had her name on it. I realized that I knew enough artists and creative people that I could curate a thoughtful, intentionally made magazine to inspire children and their caregivers. Together with Christine, my co-editor, we wanted to make a magazine that celebrated and cultivated emotional intelligence and that preserved the sacred space of childhood. Root & Star was born. Aren’t there some books that are for children but that you love just as much? Isn’t there some art and literature that speaks to the child and the ageless one in all of us? We are trying to make a magazine that accesses that level of beauty, wisdom, and joy. In this way, while we like to say the magazine is for the child who likes to be read to in their caregiver’s lap, we have many adults who get the magazine just for themselves! Courtney: We love to make this magazine so much. We work really hard on it (with children often in our laps), and we love to know that we are bringing something beautiful and meaningful into homes across the world. However, we are a small business with no private funding or advertising. We rely on subscribers in order to continue. This has become more apparent than ever as we look at our numbers this year. As many more companies merge into conglomerates, we feel strongly that small, socially responsible businesses sustain a necessary authenticity and humanity. We are SO grateful for the support of our readers because it allows us to continue to grow. Plus all SouleMama readers get 10% off with the discount code SOULEMAMAROCKS (because she does!). Code expires 8/31. This is great for a gift: we ship everything within a few days of receiving the order. We would love to receive this magazine! Seventy Freedom Rangers arrived here this week. We have had such good luck with these birds each year, and that number of them, that it was an automatic order without a whole lot of thought. We picked them up at the post office on Wednesday, which never gets old (though it might to the postal workers hearing all that chirping until we arrive!). The chicks are now tucked into the brooder till they get just a little bit bigger, and then they'll be put on pasture for ten weeks or so. It's been so warm this week. Warm for Maine, that is. And we've ended nearly each day by jumping in the lake, even if only for a quick dunk before bed. It's truly the height of summer now and the water feels so good. Slow knitting continues and that feels good too. Just a few rounds each day, and a hat is slowly emerging. I might have to cast on for something similar when this one is done, stranded knitting really is the most fun for small amounts of knitting at a time like this, as one color is added on top of another. Simple pleasure. This weekend, for the very first time since mid April when Calvin left, I will have ALL of my babies in my house together at once. Only for one night for now, because the summer camp crew changes over. But oh, that one night! I'm going to sleep so very well, knowing all those bodies are home. Wishing you and yours a beautiful summer weekend! Oh, I've so enjoyed my stretch of days with just these two littles! Steve took the older boys on a river trip, and everyone else was scattered on their own various adventures, leaving me with just these two for a bit. Such a change in the regular numbers and the rhythm of our normal, that it allowed for all kinds of relaxed freedom and connection. My favorite? Maybe our post-dinner raspberry picking that made way for breakfast ingredients (Raspberry and Cream popsicles are a totally healthy way to start the day, I'm sure of it). What a treat to watch Harper, the middle child simultaneously miss his older siblings while also thriving in their absence by being 'the big kid' for a rare minute (given gender and age spreads among my five, I think Harper really falls more into the classic 'middle child' role of the family, thoughtful little peacemaker that he is). Without his help, I couldn't have wrangled the escaping chickens (no one can catch a chicken like he can), or fixed the broken pig fencing (these things always happen when Steve is away, I swear), or known how to get to the transfer station (I'm a bit embarrassed to say that's always Steve's job!). I leaned on Harper heavily in these past days and I could see his core strengthening and spirit shining as a result. So much to be learned from that for me, and to carry forward, even when the bigger kids return. Oh, and my baby girl lost her first tooth! The youngest age at which one of my littles has done so, which is rather fitting given this child (a little about the relevance of tooth loss in Waldorf education if you're interested). She was talking (of course) when it happened, and I shall never forget the look of surprise on her face when it plopped right into her hand, mid sentence. And another childhood milestone has come and gone. Precious growing up days, these are! In Vermont, we know how important it is to take advantage of the beautiful summer months before they breeze by. That’s why our summer collection is full of exciting outdoor activities. Our new Bamboo Run Bike makes it easy for young children to zoom around the driveway, improving their balance and coordination while enjoying a classic summer pastime. With the addition of the sweet little Bike Basket, they can cart around a doll, a snack, or a bouquet of flowers. Speaking of classics, kids love our wooden Sturdy Stilts. This age-old game never gets old. The challenge of balancing atop the pegs will keep children’s attention for hours as they play the day away in the backyard. We all know how important it is for children to connect with nature, and the Fairy House Kit is just the thing to encourage little ones to marvel at the beauty in their own backyard. The kit has all the inspiration they’ll need to create a magical realm for friendly forest sprites. When you head to the beach or lake, make sure to bring along the Schooner. Children love captaining this toy wooden sailboat on any body of water. Make sure to incorporate some educational activities into your summer fun with the Weathervane Kit. This science project lets children build their own weathervane and monitor the direction and speed of the summer breeze. Alas, summer can’t stay forever, but Nova has you covered for back-to-school adventures as well. Before kids return to the classroom, help get them in learning mode with a set of engaging Early Readers with unforgettable characters and easy-to-follow plots. When it comes time to head back to school, it really is the little things that make for a smooth transition. With a set of our Lyra Colored Pencils in an adorable Kitty Cat Pencil Case, they’ll be eager to soak up new knowledge. As a homeschooling activity or just a fun project for after school, the First Draft Drafting Set lets children try their hand at design. They’ll be drafting plans for a new treehouse in no time! Top off the school day with a nourishing snack in our new Tiffin Metal Lunchbox, and your young academics will be thirsting for more knowledge. I see gifts for the grands!! Thank you! Alewives Fabrics is located in a big red barn in Midcoast Maine. We were established in 1975 and for the past 13 years have been owned and operated by the mother/daughter team of Barbara Neeson and Rhea Butler. Alewives carries an eclectic, contemporary mix of fabrics. We focus primarily on quilting weight cotton, but we also offer linen/cotton blends, lawn, voile, vinyl laminate, chambray, home decorator weight, rayon, jersey and more. Alewives is also a flagship store for Quince&Co yarn, and we have a special focus on English paper-piecing supplies. Alewives Fabrics is on Instagram, Facebook and Twitter. Rhea: It's summertime in Midcoast Maine and this is our busy season at Alewives! We've recently added new Quince&Co yarns to our inventory with their Ibis (a chunky merino mohair blend) and Willet (a soft and springy cotton), which means we now carry ALL of the Quince yarn substrates! We have also started carrying Making Magazine and it's been extremely popular (to say the least). We're so pleased to be featuring products like Quince and Making as they are both produced right here in Maine. Our local customers love having a brick and mortar store to browse and purchase these items in person, but our summer visitors love bringing home a crafty souvenir of their time in Maine. A copy of the latest issue of Making Magazine (issue number 3: Dots). This issue features knitting, sewing, embroidery and crochet projects, plus interviews and recipes. We're also including a set of Drina's Designs spinning wheel stitch markers, which are handcrafted here in Maine by our friend Cindy Arnold. In addition, Alewives Fabrics would like to offer Soulemama readers FREE SHIPPING on all domestic orders ($10 off international orders) from www.alewivesfabrics.com through Sunday, July 23rd, 2017. Customers can receive the discount by typing SOULEMAMA into the promotional code field at checkout. Looks like such an amazing place to visit. I miss the North! What a different view than my normal! I spent a good part of this week staying in the "city" working on some Taproot things. I'm a big fan of holeing oneself up to really crank out the big things and that's just what we did. Focused attention like that on one task for so long feels so good, so productive. And also exhausting. If only for this introvert who went far over my spoken word limit by Tuesday at noon but kept on anyway. Phew! The weekend ahead looks like bliss. Catching up with an old friend for dinner, to be followed by a weekend with nowhere to be but HOME. We've got a small crew at home right now too - everyone is off adventuring. So I'm sure to get some quiet moments, plenty of stillness and a whole lot of green. There is a garden to tend, woods to be walked, animals to be fed, and I think we just might get some raspberry jam made too. Sweet life of summer. Wishing you the very best weekend ahead, friends! I had the great pleasure of meeting Amanda when we worked together in the Taproot tent at Mother Earth News Fair earlier this year in Asheville. It was early May, and down there, they were deep in the work of getting the garden planted and already harvesting the early things. With the late season that we had up here in the north, plus my travel, I was a long ways away still from getting our own garden in and I remember hanging on every word of Amanda's. Her garden, it turns out, is as beautiful as I imagined. I'm glad to be sharing it with you here today, along with her wise words and thoughtful reflections on why and how she does it. Garden Size: approximately 1000 square feet of dedicated garden space between the raised beds, rows, and herb/fruit/berry beds, plus a few scattered fruiting trees and vines. I garden for so many reasons- but mostly because I know this is how to get the freshest and healthiest food possible for my family, for the free therapy (nothing grounds me and helps shift my perspective when needed quite as quickly as getting my hands in the soil), and because I am beyond hooked and I don't think I actually know how not to garden anymore. At this point, I feel like it is a part of me and that it is in my bones and in my blood, nourishing me in a soul-deep way that few things do. It is the pursuit/hobby that brings me the most joy and fills the most of my hours, from actual time spent in the garden to hours spent daydreaming and flipping through seed catalogs as I sit by the fire in the winter. Our garden is a mix of raised vegetable beds of various materials (cinder block, stone, brick, wood, and a hugulkultur bed), rows, and flower, fruit, and herb beds~ I like to think of it as thoughtfully and purposefully arranged but with a good bit of wild thrown in as well. The garden (along with the bee-yard and chicken-yard) takes up nearly all of our backyard, leaving just enough room for our fire pit, bean bag toss, and a small patch to run around in. Truly, the garden IS the backyard, and the backyard IS the garden- throughout the space there are beds and patches dedicated for growing. I figure we may as well use as much space as we can to grow some food and medicine and beauty. Tanya Denckla's book The Organic Grower's Home Reference (out of print, but updated edition here), and the Fedco seed catalog. Voles (though our cat Ollie helps a lot in this department), and the dreaded tomato blight we can't get away from here in the Southeast. It is so satisfying to see the transition that our yard has made since we started gardening in this space 7 years ago. We've turned our yard from nothing but grass and a dead apple tree into a little (sub)urban homestead oasis of sorts complete with three bee hives, a chicken yard, dozens and dozens of raspberry, blueberry, and blackberry bushes, elderberries, a half dozen fruit trees, a hazelnut tree, herb and flower beds, a small fish pond, and lots of raised vegetable beds. Though we don't have the space to grow all (or even most) of our vegetables for the year (though in the summer we get pretty close), the places where we have been able to do that truly do feel like big accomplishments. There are some things we never really need to purchase, and that feels like something. Garlic, for instance. Honey. Eggs. Greens for at least 3/4 of the year. Green beans. Berries enough for all of our jam needs. When the weather permits we tap neighborhood sugar maples and make more syrup than we need to last us the year. There is such satisfaction in these baby steps towards self-sufficiency. Garlic, greens, herbs, berries, and flowers. If I had to get more specific I suppose I'd say garlic, kale, thai basil, raspberries, and larkspur. (Of course the larkspur is blooming as I write this, so I cannot claim my answer isn't swayed by the current state of purple-blue-pink dreaminess). Oh- and also snap peas. I have a seven-year-old daughter, Claire, and she spends much time in the garden. When she was 18 months old she started really wanting to actively 'help', and I remember constantly finding unripe cherry tomatoes and blueberries in her sticky, grubby little toddler hands. What a lesson for me! As someone who really loves her garden and was anxiously awaiting the first ripe blueberries from new plants, it wasn't always easy for me to relax into these discoveries of shiny green orbs that were meant to ripen into juicy blueberries and bright, sweet Sungold cherry tomatoes. But, we adapt. And so right around then I started giving her her own tasks and space in the garden where she could dig all she wanted to and generally do as she wished. It wasn't long after that that she was really able to actually help a bit with a good amount of direction and careful explaining. I'd have her help as I made our seed starting mix, or sifted compost, or help to harvest the things that are hardy enough to withstand unrefined toddler harvest techniques....... Nowadays I can send her out to harvest just about anything and she knows all of the flowers and herbs from one another. She tends her fairy garden, which she takes much pride in. She likes to create her own tea blends from the herb and flower beds and I often catch her nibbling on all sorts of things. She has always been a big vegetable eater, and a pretty adventurous eater in general, and I have no doubt that being so active in the growing and harvesting of her own food has had a big impact on that. As a homeschooling family, the garden has also been a big part of our curriculum, and not just with the obvious things such as botany and biology, but also in subtle ways with math, art, ethics, and simple observations on cause and effect, etc. There is just so much to be learned by observing a garden. Mix things up! While I generally do have areas dedicated specifically to herbs, flowers or vegetables, I make a point to add at least some flowers and herbs to most vegetable beds, and sometimes sneak a vining squash or melon in with our flower beds. I find this both extremely aesthetically pleasing (as much as I love to garden for practical purposes, I am very much an aesthetic gardener) as well as making more efficient use of gardening space. Home composting is also a big part of our garden plan and system, and one thing we've started doing that works well for us is to pile our fall leaves into the chicken yard for the hens to scratch up and scrounge through all winter, and by spring they have worked it into a very nice leaf mulch that we can add to our compost tumbler and pile and also use it directly as mulch on the garden beds. We like to think this is just one more way that the chickens 'earn their keep'. My favorite way to start the day is with a cup of hot tea and an early walk around the garden after letting the chickens out. This usually involves berries, the smelling of flowers, and the lingering over patches of dappled morning sunlight. 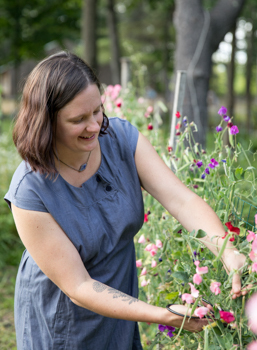 Thank you, Amanda, for sharing your garden with us! It's crazy. They come home, and then they leave again. Just like that and in the blink of an eye. And I have to laugh because really isn't this exactly the very thing we've raised them to do all along? And I should take this as a sign of success of some kind, maybe have some pride in these independent and adventurous beings? I don't know that I ever thought through the consequence of raising independent kids, because it means they LEAVE us! Ah! "But wait a minute!" I find myself running out the door and barely stopping myself from saying as they pack up for what comes next. I jest, mostly. Of course I'm proud and pleased as punch for them, to be sure. It's just a rather wild ride, this business of letting them grow up (and leaving). They're always just a step ahead of me too, and I think (quietly, to myself) "I wasn't quite ready for this/that or the other thing yet..." But it's not their job to wait for me. The oldest is back out the door again for one summer adventure to be followed by another (with his brother). I won't see him for another week. We got a letter from Adelaide at summer camp with two short sentences. It read "I'm having fun! I love you!" I'm grateful to her for knowing just exactly what I needed to hear, however short on words she was in the telling. That's all I need. And the youngest two are currently so caught up in their track team and sleepovers with friends and counting down the days until their own (day) camp begins (though thankfully those two have a hearty dose of home and leisurely summer days still to be enjoyed in their young selves). Our celebrations these days become more precious and I hold on even tighter to the moments when we're all gathered. We had a normal house full this weekend - ours plus extras, which is just the way I like it. We celebrated Gram's birthday. There was swimming in the lake, popsicles in the treehouse, and in the midst of everyone preparing for this week's adventures (me too, as I hit the road this morning! ), there were a whole lot of tighter-than-usual hugs, and late night chats with these growing kids who stay up way past my bedtime. Times change. And really, it's all so good. Bee’s Wrap was founded in 2012 by Sarah Kaeck, a mother of three who was seeking to eliminate plastics from her kitchen, and is now handcrafted in a Bristol, Vermont workshop tucked at the edge of a winding river. Bee's Wrap is on Instagram, Twitter and Facebook. Sarah: It's picnic season, and we have been discovering more ways in which Bee's Wrap is great for the outdoors! Whether you are wrapping half of a watermelon for a summertime playdate, covering a bowl of pasta salad for a family BBQ, or bundling up a hunk of baguette and fresh brie for a picnic in the park, Bee's Wrap is the sustainable storage solution for all your outdoor adventures. Wrap up your sandwich and snacks when heading out on the trails, then use as a placemat for zero-waste hiking. Did you know you can also use Bee's Wrap as a jar opener or a natural fire starter when in a bind? This summer, be sure to reach for your Bee's Wrap for convenience, simplicity, and sustainability. Our best-sellers – the Assorted 3-Pack, Bread Wrap, and Sandwich Wrap – are the perfect introduction to Bee's Wrap and will help individuals and households to make the shift away from disposable food storage for good. Simply use the warmth of your hands to soften the wax and mold the wrap around a piece of food or over a bowl; when cool, the wrap will hold its seal. Naturally antibacterial. Wash in cool water with a mild dish soap, and air dry. Oh happy day! Three months is over, and Calvin is home from France! I think it went a lot faster for him than it did for the rest of us, but nevertheless, he's so happy to be home and for that I'm even happier. He had a wonderful stay, with a loving family in Viry, and attended a Steiner school in Geneva (which coincidentally - or not - just so happens to have one of the best skateboard parks in the world, did you know?). Toss in a week in Florence, Italy and weekend hiking and climbing trips in both the Swiss and French Alps, and I think it's safe to say he made some lifelong memories. Now excuse me while I soak this boy up, and ask him to tell us all another story before he heads off on his next adventure (because that's the way it goes!). Somehow, in the past forty-eight hours, we've managed to squeeze in both lake and ocean, cousins and friends, boating and eating, all with a healthy dose of fireworks and s'mores mixed in. My children are exhausted (and filthy), and it's the best kind of exhaustion (and filth) to witness. Hours spent in the water, and running slightly wild with gaggle of children. True summer, I tell you. True blue summer. We dropped this little girl off at sleepaway camp this weekend, where she'll stay for three weeks. Three weeks! How on Earth I agreed to that, I have no idea. I'm certain it was the depth of winter, and likely there was lots of sibling strife and maybe we were all driving each other a little bit winter batty (it's totally a thing). That must have been the weak moment when I agreed to let Adelaide go for three entire weeks. We already miss her so, but as you can see by the look on her face, she's more than happy to be there. And truly, I'm happy for her to be so happy (and in a place we love and trust so much ourselves). I love the sweetness that comes along with the departures and arrivals. The kids were all quite tender with each other in the days leading up to dropping her off, and I came into a room to scenes like the above more than I can count. Reading to her little siblings, them making cards for her and tucking them into her bags as a secret. All such good things. She has her letter satchel, of course, and there will be so many letters back and forth in the coming weeks. I love that too. And so the dinner plate count goes down one more. What a strange moment that is each day when I pause at the kitchen shelves to do a head count of who is here and who is away. For a while, it used to be so second nature, grabbing those top seven plates on the stack. But now, with Gram and Andy here, and often someone's friend, but always someone is somewhere else...well, I never do know until that moment where I have to count dinner plates. Hovering between six and ten is a safe bet when I start making dinner, leaning towards ten. Off on so many adventures, they all are. Which is all fine and good, just so long as they keep coming home and back to my dinner table.